Soak up the charms of Mexico. Experience fast-paced Mexico City and uncover the ancient ruins of Teotihuacan. 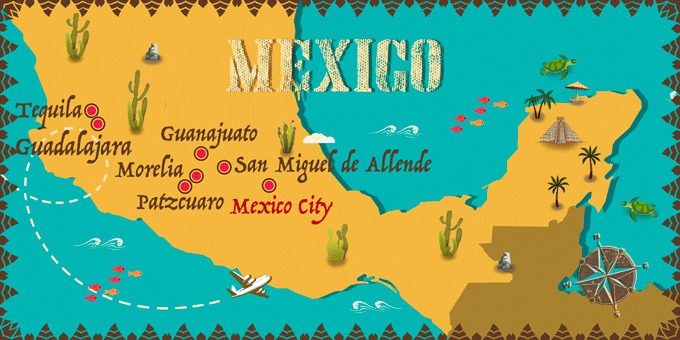 Admire the atmosphere of 14th-century Patzcuaro and lively Guadalajara, land of Tequila. Let Guanajuanto captivate you with its Old-World character and delve into the colonial-era in colourful San Miguel de Allende. International flights: UK - Mexico City - UK. * You will have the option to purchase travel insurance in the final stage of the booking. Arrive at your UK departure airport, ready for your flight to Mexico City. Arrive in the capital of Mexico, known for its Aztec temple and Spanish conquistador influence, and transfer to your hotel. Overnight stay in Mexico City. Breakfast at the hotel. At the indicated time, transfer to the airport for a flight to UK. Night on board. No visa is required. Departure tax from Cancun is 1000 pesos (around 55$).